First, let’s start with the good. Actually, the really good. Jasper had a wonderful week! If it wasn’t for the lump on his side, you wouldn’t even know that he was sick. He was jumping on the bed, running to the door with a tennis ball in his mouth each time I got home and playing and swimming in the river with no sign of pain. What a change from last week! I can’t tell you how great this makes me feel. Other than tweaking his pain meds, we really didn’t change anything else this past week. 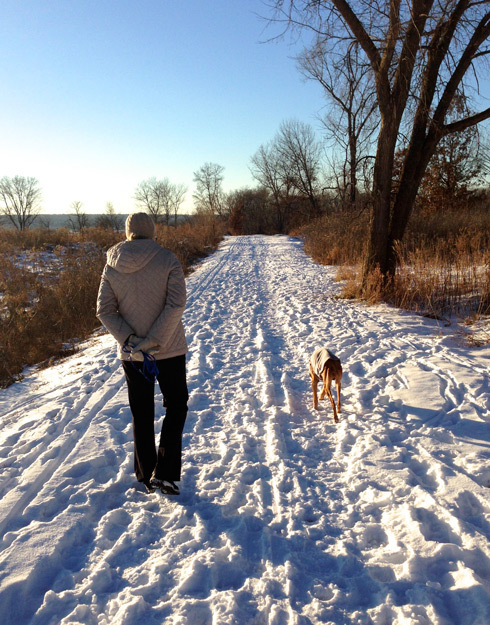 He even felt strong enough for another 3+ mile hike in Afton State Park on Saturday. Like I said, it’s been a good few days. The other nice thing that happened is that we got our first look at the photos we recently took with the extremely talented Sarah of Sarah Beth Photography fame. Her photos are truly magical. I’m sure when I’m old and grey and enjoying my last days on this planet, one of the photos she took will be sitting by my bedside. Thank you, Sarah! 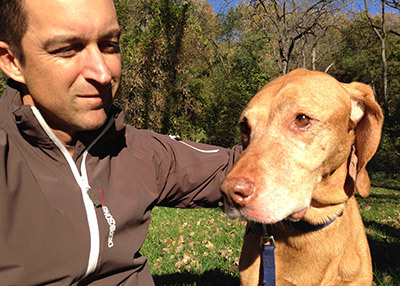 We had another heart-to-heart with the veterinary oncologist this past week. We’re almost certain that Jasper’s latest – and likely last – chemo drug isn’t slowing the tumor’s growth. At this point I’m starting to think that this is some sort of super-mutant cancer. We’ve tried everything we could to slow it down, but to no avail. This was part of his response to our question about how we’ll know when it’s time to say good-bye. For starters, we’ve begun to accept the situation. All we can do now is manage the cancer with pain meds. J is on pretty low dose medication at the moment and he had a great week, so at least we have that on our side. I feel strangely positive tonight given the gravity of our situation. I’m sure all that could change in the coming days and weeks, though. Veronika and I have also started making plans for the end. We have the name of a vet who does at-home euthanasia. We have the number for a place that handles pet cremation. We’re getting things lined up now because we both know that when the time comes to let go we just won’t be thinking straight. Which brings me to the unknown. We still don’t know for certain how this will play out or how much time we have left. 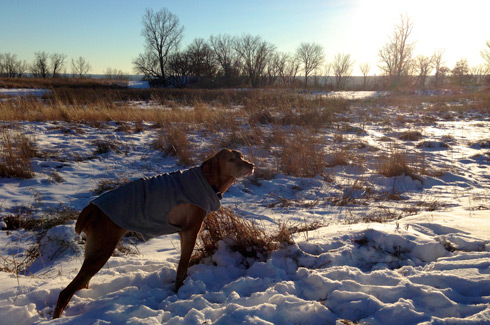 Today was a beautiful day, though, and J had a joyous time running and swimming in the Mississippi River dog park. I’m happy and thankful for that tonight. Who knows what tomorrow will bring, but while he’s still here I’m going to walk over and give him a good-night hug. Another day, another round of national press for our little superstar doggy Jasper. The good folks at Petopia asked me to write a guest blog a couple weeks back. The entry I prepared for them – “The Calm Before the Storm” – is now available online. In it I write about J’s diagnosis, his never-ending love of water and waiting for what’s next. Hope you enjoy the entry. Jasper is back at the U of M vet today for his bi-weekly update. He’s been a little more tired and stiff than usual this week, so I’m anxious to get the vet report later today. In the meantime, I’ve been dreaming of snow, but I’ll save that for my next entry. How long does hope last? How long does hope last? The question has been on my mind all day. We often say we’re hopeful that we’ll get the job, hopeful that we’ll do well on the test, or hopeful that tomorrow will be better. But is there a point when we give up hope and accept our situation for what it is? I’ve been thinking about this a lot today. The last couple weeks have been a roller coaster. A week ago Tuesday, while Veronika was traveling, I was startled awake at 4:30AM by Jasper crashing off the end of the bed and nearly falling into the wall. His whole body was shaking and he could hardly stand up. At first I thought perhaps I had had a bad dream and startled him. After the second car race to the ER in a month (thank goodness the hospital is so close), he was taken into intensive care and I was left to wait. Once he was stabilized, the docs sent me home and said they’d call when the specialists arrived for work. Found out later in the day that he likely had a blood clot in his brain. My first thought was, “Damn! Don’t know how much of this I can take.” By evening, he was back to normal and we haven’t had any issues since. Today was yet another follow up visit with the veterinary oncologist, Dr. Husbands, and his team. I like this particular doc because he seems to genuinely love Jasper as much as we do. Well, almost. Fortunately, the tumor has stayed pretty much the same size, maybe even shrinking just a little. The next thing we’re going to try is a somewhat experimental drug – can’t remember the name right now – that will essentially try to keep the tumor from growing any new blood vessels and expanding. That’s the hope at least. Best case scenario is that it halts the growth and may actually shrink the tumor. Second best is that it’s simply inhibits growth. Third possible outcome is that nothing happens. In that case, the doc gives J one to six months to live. Hearing those words – “one to six months to live” – is like a kick to the gut. So, this is where “hope” comes into play. We were hopeful that surgery would get rid of the cancer. Nope. We were hopeful that chemo would take care of it. Nope. We were hopeful that radiation would work. Seems to have slowed the tumor. A little. 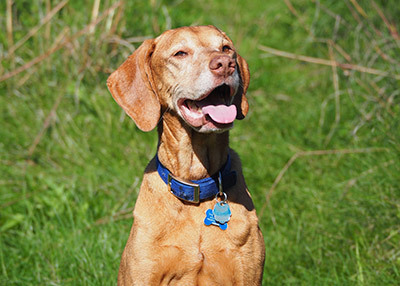 Now we’re left to hope that an experimental drug that wasn’t developed for this type of cancer will give us a little more time with our dear Jasper. And so I’m back where I started. Wondering where does hope end? And perhaps, where does reality set in? I guess all I can do is try to enjoy each day and each moment now. Having tried surgery and chemo without success, radiation was our next – and likely last – option. It’s really starting to sink in that Jasper has a terminal disease. I’m also beginning to realize that this will likely be our last summer together. I’ll comment more on that thought in a future post, though. J began twenty-two weekdays straight of radiation in mid-April 2010. Each morning he had to be in to the hospital before 8AM and I was able to pick him up in the late afternoon. Around the fifth day I started to notice something. The same group of us were there in the lobby each morning with our dogs. Silently going through the same experience but never really reaching out to one other beyond the cursory “Good morning.” Strange in hindsight because it probably would have been nice to chat with someone who truly knew what it’s like to be in this situation. Thrown into the mix, there was also the new low-protein dog food and loss of appetite to deal with. By the end of radiation Jasper had lost nearly a quarter of his total body weight, but he soldiered on. When he was discharged on day 22, I actually felt a bit sad. Throughout the radiation treatment I had the comfort of knowing that we were doing something to try to save him. Now that we were at the end, it started to sink in that there really wasn’t anything else we could do other than wait and hope the radiation stopped or slowed the tumor growth. On the last day, the doctors and nurses gave us a beautiful card with words of encouragement for J. They also gave Jasper a new squeaky toy that Zooey (our other Vizsla) has been eyeing like a hawk checking out the latest road kill. Two weeks after the final treatment we were back to meet with good ol’ Dr. Claire, the veterinary oncologist from Australia. There’s something strangely comforting about discussing a deadly disease with someone who has an Aussie accent. Plus her nickname for Jasper made me smile. Following the initial exam, we got down to some serious Q&A. Q: Did the radiation work? A: The tumor has only grown slightly, so that’s a positive. The best result is to shrink the tumor, but slowing the growth is the next best outcome. Q: I guess I need to mentally start preparing for the end of his life. Does he have three weeks or three months or something else to go? A: Definitely more than three weeks. Beyond that it depends on a number of factors. A: Have we slowed the tumor growth? Will it metastasize into the lungs? So where we once had a ray of hope, now we just have a bit of light coming through the window shades. Have to stay positive and really try to live in the moment, though. Next appointment: One month from now. *Note: Apologies for the choppy entry today. Sometimes the emotion of the situation gets to me and it’s tough to be poetic. More upbeat entries coming in the weeks ahead. Promise.